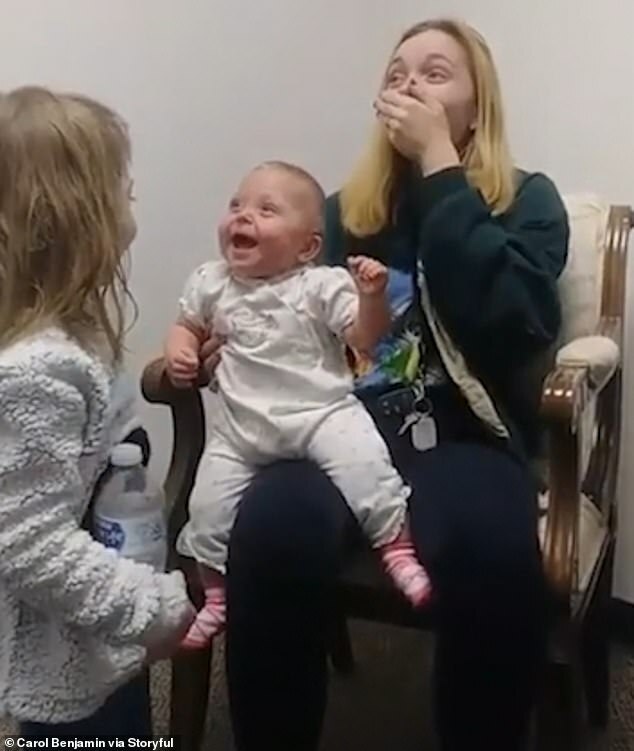 This is the heartwarming moment a baby hears her big sister’s voice for the first time after being fitted with hearing aids. 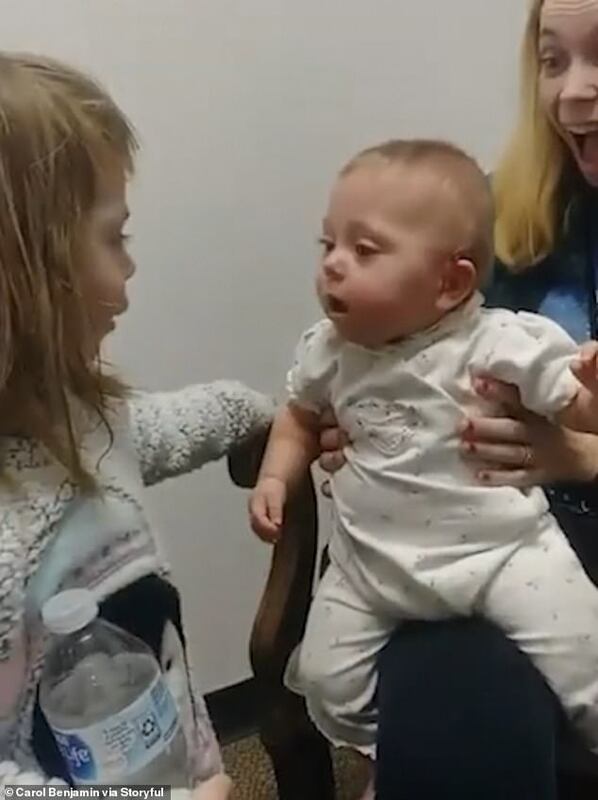 In the footage, Scarlet, who was born three months early, looks at her sister Halie in amazement as soon as the device is fitted to her ear at Atlanta Hearing Associates in Milledgeville, Georgia. Little Scarlet begins to giggle hysterically when she hears her sister saying hello to her. And another look of delight crosses her face when she turns round to hear her mother’s voice in her ear. 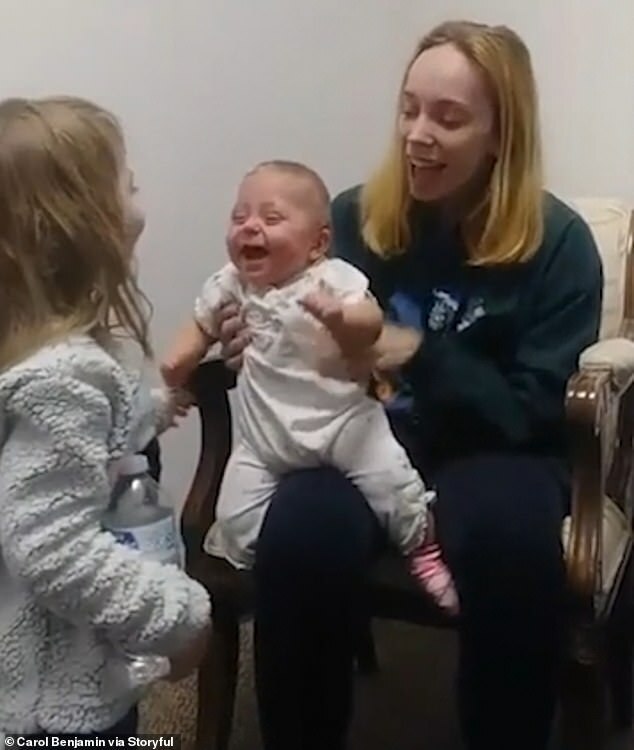 Scarlet’s spontaneous laughter continues as she listens to her mother and sisters voices talking to her. Mother, Carol Benjamin, puts her hand over her mouth in shock when she sees her child’s reaction. She is moved to tears of joy when she sees how excited she is at now being able to hear. When little Scarlet was born, she developed an intestinal problem and the antibiotic treatment for it impaired her hearing. Ms Benjamin wrote on Facebook that she thought Scarlet’s hearing was good but realised her daughter’s reaction when she was fitted with the hearing aids showed it was anything but. Talking of the moment, Ms Benjamin said it was ‘one of the absolute best days of our lives’.